The Islamic State of Iraq and the Levant is a terrorist organization supported covertly by the Western military alliance. 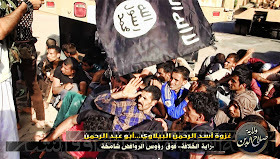 The Islamic State of Iraq and the Levant (ISIS) claims to have executed 1,700 Iraqi soldiers. Those who trained and financed the ISIS rebels have blood on their hands. A couple of days ago, ISIS declared that they had captured 4,500 Iraq soldiers in Tikrit. These photos were released by ISIS — they are not doing this under cover of night or in hiding. They are proud of their slaughter in the cause of their -twisted and sick- Takfiri belief. WARNING: Many of the images below are graphic. 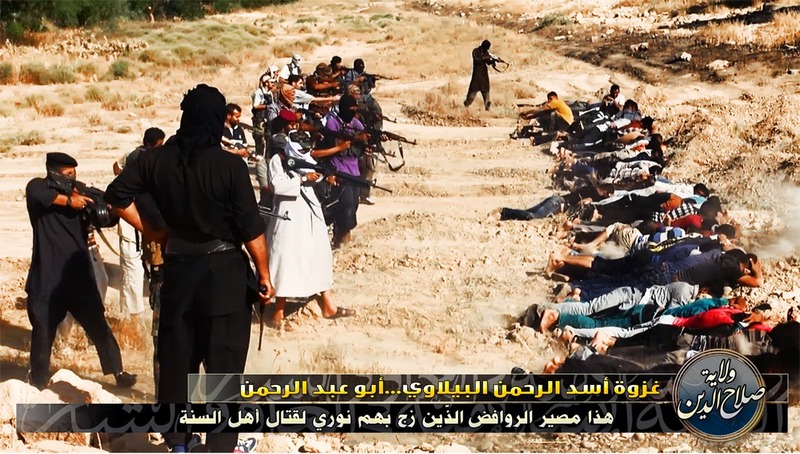 The intent of publishing these photographs is to document the war crimes committed by the ISIS. The full horror of the jihadists’ savage victories in Iraq emerged yesterday as witnesses told of streets lined with decapitated soldiers and policemen. 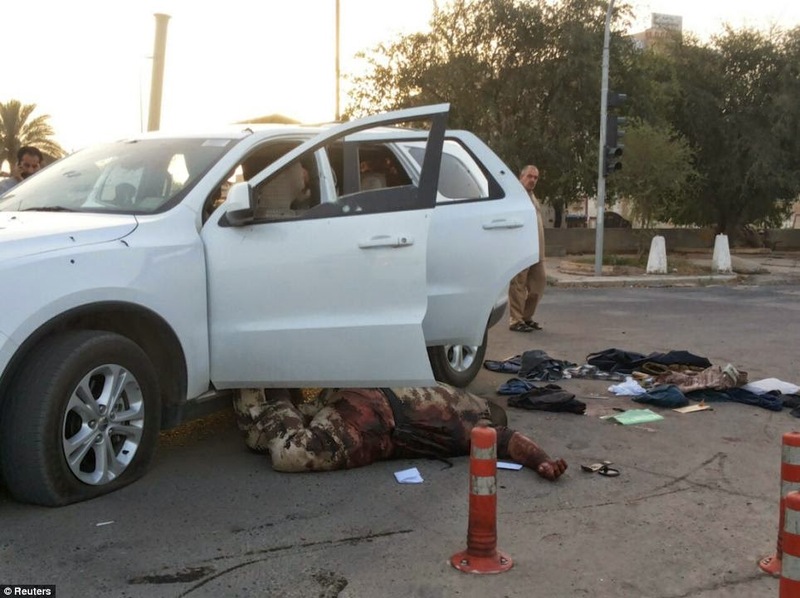 Blood-soaked bodies and blazing vehicles were left in the wake of the Al Qaeda-inspired ISIS fanatics as they pushed the frontline towards Baghdad. Thousands of residents in the capital answered a call to arms to repel the invaders amid fears the government’s own troops were not up to the job. Aid groups warned of a new refugee crisis after half a million terrified Iraqis left their homes to escape the jihadists..
No, Roth, no, of course, they are not “alienating” the local population.. No alienation. Just beheadings and total executions!!. .. The Islamic State of Iraq and the Sham’s administrative division in Salahaddin proudly displayed photographs of the capture and execution of Iraqi soldiers after it took over a base in the province.The graphic photographs were released today on the Twitter account belonging to Wilayat Salahaddin, or Salahaddin Division. The ISIS has divided its “state” in Iraq and Syria into 16 administrative units, or wilayats.The stream of photographs begins by showing ISIS fighters in dirt-caked pickup trucks with machine guns mounted in the beds traveling to Tasfirat prison in the city of Tikrit, and then launching an assault with dismounted troops. Tikrit fell to the ISIS earlier this week. After capturing the base, the ISIS takes photographs of dozens of US-supplied armored Humvees, Ford and Chevy pickup trucks, and various military transport and supply vehicles that were left behind. ISIS fighters are then photographed posing over the bloodied and mutilated corpses of the slain soldiers. The ISIS photos show the capture, transport, and execution of scores of Iraqi soldiers. Most of the soldiers are in civilian clothes, but some are seen wearing civilian clothes over their uniforms. Iraqi soldiers had reportedly shed their uniforms and deserted en masse as the ISIS blitzkrieg advanced from Mosul to Tikrit and on to the outskirts of Samarra in the course of one week. At least four Iraqi Army divisions are said to have melted away during the ISIS onslaught. In the photos, the Iraqi soldiers are rounded up at gunpoint and placed on flatbed trucks, some of which appear to have been captured from the base. Some of the ISIS fighters are seen holding US-made M-16 assault rifles, which had been issued to the Iraqi Army and police forces. The ISIS fighters then order the frightened soldiers to lie face down in shallow ditches, with their hands behind their backs. ISIS fighters then open fire on the unarmed prisoners of war. The ISIS is said to have executed thousands of Iraqi soldiers during its southward advance to Baghdad. Several Iraqi military bases are believed to have been overrun. Forward Operating Base Speicher, which once was a major US military hub in Salahaddin province, was reportedly seized by the ISIS during its southward push. Over the past week, the ISIS took control of Ninewa and most of Salahaddin province, as well as parts of Diyala province. Most of Anbar province fell under ISIS control in January.